Last night I got off work and headed straight to the grocery store. I was on a mission to stock up on the ingredients I’d need for the next day to make my slow cooked BBQ chicken. I grabbed some fresh onions & garlic and hopped into a checkout line. The woman in front of me in line immediately apologized for the amount of items she had. I assured her that I was in no rush, but her tired eyes only became more frazzled. The woman grinned and asked me if I had a daughter. I laughed and said no, but I explained that I had one of those “fathers” who wasn’t really cheering me on and celebrating life with me. A father who was also “forgetful“. Forgetful of birthdays, choir performances, dance recitals, and holiday dinners. I thought about the amount of times I watched my mom go above and beyond, partially out of love and partially to make up for the other half of the team that dropped the ball. I could see the woman’s facial expression soften. She thanked me for my patience and I wished her good luck with the birthday festivities. As we parted ways, I thought about how lucky I am…how lucky all of us are that we have a true father. It’s easy to remain hurt. It’s never going to disappear. 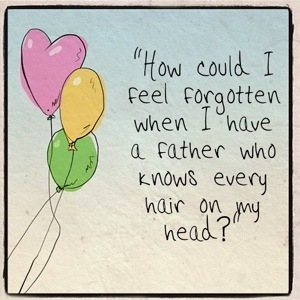 But how can I continue to feel forgotten when I have a father who knows every hair on my head? How can I feel left behind when my father has promised me eternity with Him? How can I feel unimportant when it is written that I am marvelously made? I’ve been that 5 year old girl. My mom has been that mother…scrambling to create perfection in the midst of brokenness. But the cool thing is to look back and know that God was present through it all. He never abandoned me on a birthday or one moment of life. and He is celebrating every day for you. Previous postMother’s Day Give Away! Next postHow to get perfect summer beach waves! Rachael, this is beautiful truth captured in words that soothe a soul! So interesting to find out how much we have in common, too.